Lachlan Turner (middle names not decided yet) was born at 12.18pm on June 24, which just happens to also be my wedding anniversary 🙂 Yes, the most amazing gift ever, I know, but now we get to share it every year with him as well, and I know who will come first, at least for the next couple of decades… 🙂 No harm there though! 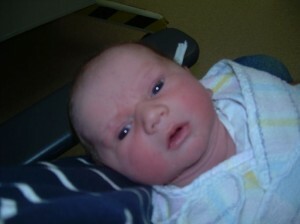 Lachlan weighed in at 4.04kg and is 54cm in height. He and Sallie are both doing well, though Sallie is pretty out of it from the caesarian of course. They’ll bot be in the hospital until at least Sunday, leaving me to look after Will and Alex. Fun! A big, big day. More later, I think, when I can post more pics, and even video, finally!